The UCI race radio debate received a lot of attention around 12 months ago regarding their use in the pro peloton. This debate was miles away from the amateur racing scene and national series racing such as the NRS here in Australia where no rider communication is allowed, other than word of mouth out of the team car. As is usually the case, technology moves a lot faster than the regulators, the UCI included. 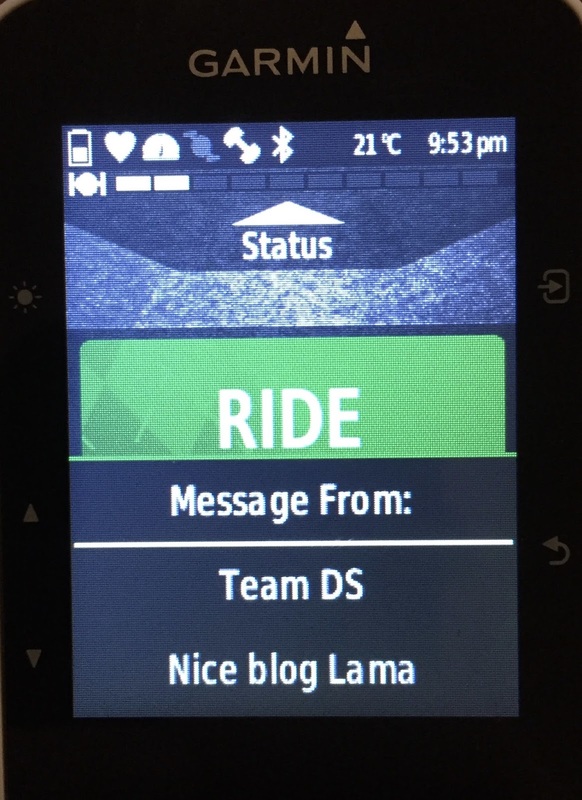 After a few rides with the Garmin Edge 520 and it displaying my incoming text messages without lifting a finger..... I wondered how this could be used in other ways. 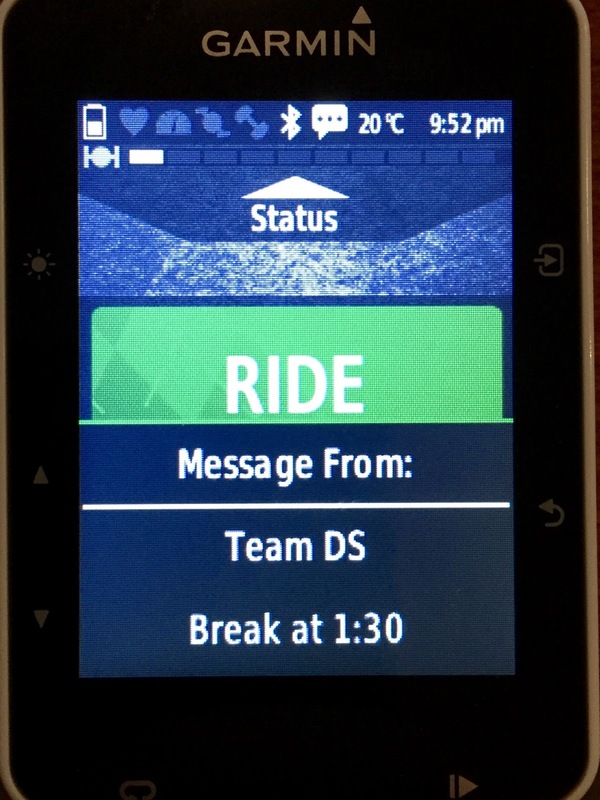 Picture this - A team in a peloton of 160 riders equiped with Garmin Edge 520 (or 1000) units, mobile phones in their back pockets, and race updates/instructions bring sent via group message to them from the team car. 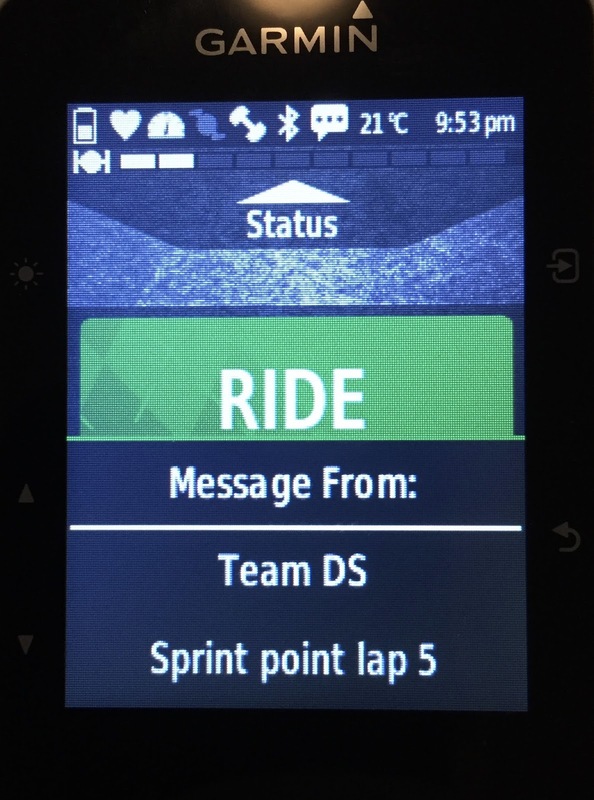 No dropping back for instructions and immediate communication to all team riders. And no easy way this can realistically be stopped from happening. I suspect most riders and teams already have the hardware to do this right now. Technically there are regulations in place to stop this happening (see below). 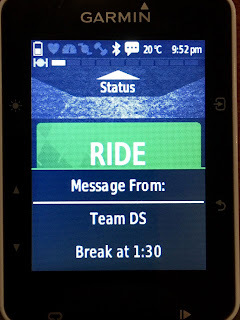 However, short of banning all next-gen cycle computers and checking riders pockets for mobile phones, it is impossible to enforce. 3.8.14 The use of iPods, MP3 players etc, reading devices or sunglasses fitted with portable music players and any other type of entertainment devices including mobile phones and wireless transmitters (Bluetooth etc) shall be strictly forbidden during competition and warm up periods on the road prior to the event. 3.8.15 During races the use of radio links or other means of communication with the riders is not permitted. From local races to NRS tours, and everything in between. Don't be surprised if the rider next to you looks at their Garmin and goes on the attack, or somehow a whole team magically knows something you don't in a race. Sprint point distances, who's getting dropped, KOM point calculations, weather conditions, changes in team plans, get creative and the list becomes endless. At this point in time it is only one-way communication, stand-by for that to change in the near future too. 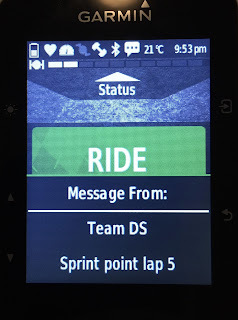 The garmin rider tracking with the same headunits could also be interested as you could see where riders were located in a race (or multiple team mates for example if someone was in a break and another team mate in the peleton). Handy for knowing how close riders are to feedzones, but also for organisations running races with road closures with riders approaching dangerous corners, KOMS and finishes. From the point of view of spectators (where much of VRS races are followed only on twitter feeds) it would be fascinating to have a whole peleton being tracked, especially if they are all shown on one map, ala tour sbs tour tracker. With warnie having 300 riders it wouldve been fascinating viewing. Let alone all of the data from power meters etc which would be fascinating to chart and compare. 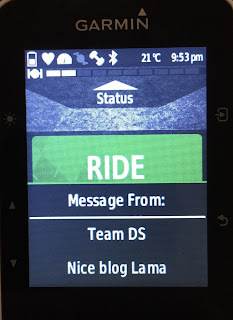 Understand the SMS notifications could provide a real (illegal) advantage for example in handicaps finding time gaps between riders, but it could also at the same time provide improvements in safety for example if you have a race with multiple feedstations, you could hypothetically be informed where your swanny was in the feedzone to avoid hunting around (which is a common location and cause for crashes). Of course all completed illegal, so I wouldnt do it.